Something a bit different: a road movement. Its home at Didcot Railway Centre, near Oxford, a "living museum" of the Great Western Railway. They have a number of locomotives there which they rent out to heritage lines. 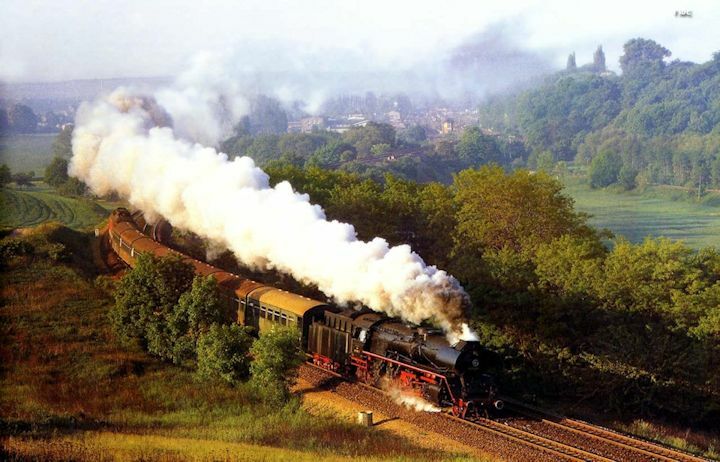 Number 93, the steam railmotor (steam driven carriage), comes from there. Not steam, but this is the first special excursion passing through this season. There was a time this class of locomotive hauled most long distance trains through Totnes. I had seen all 50 members of the class long before they came to the south west, in the late 60s and early 70s when they were brand new and sounded different because of large cooling intakes which led to them being nicknamed "Hoovers". The "toot-toot" as it went through the station? That was the locomotive. I took an hour off from work today to film this engine movement through Totnes. TMD = Traction Maintenance Depot. There's a diesel hauled special to the same destination tomorrow with locomotives we don't normally see through here, so I'll try and film that too. The two tone horn? That's a traditional British Railway diesel horn. Sorry Squirt , no horn.